Want to be notified of new releases in klaussinani/taskbook? 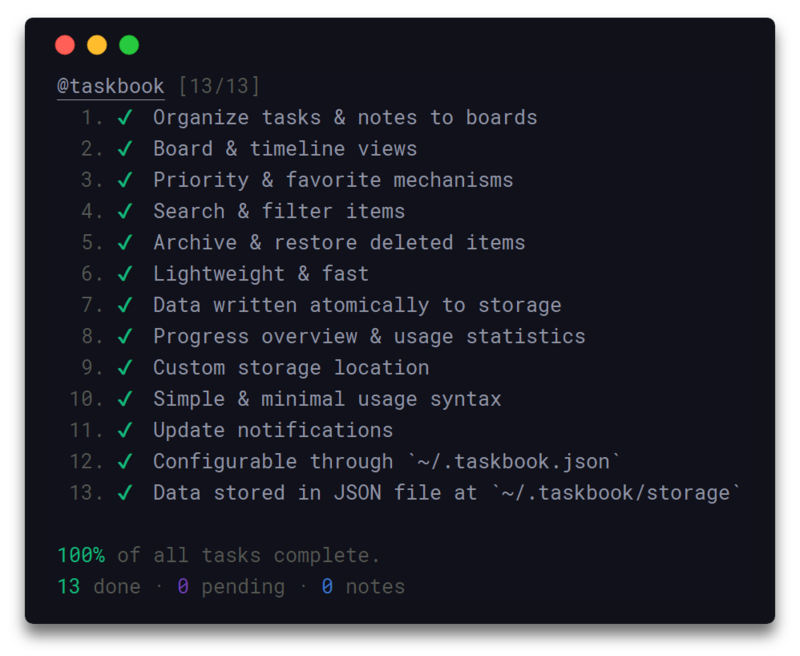 By utilizing a simple and minimal usage syntax, that requires a flat learning curve, taskbook enables you to effectively manage your tasks and notes across multiple boards from within your terminal. All data are written atomically to the storage in order to prevent corruptions, and are never shared with anyone or anything. Deleted items are automatically archived and can be inspected or restored at any moment. Read this document in: 简体中文, Русский, Français. View highlights in a taskbook board. Note: Due to the snap's strictly confined nature, both the storage & configuration files will be saved under the $SNAP_USER_DATA environment variable instead of the generic $HOME one. Invoking taskbook without any options will display all saved items grouped into their respective boards. In order to display all items in a timeline view, based on their creation date, the --timeline/-i option can be used. To configure taskbook navigate to the ~/.taskbook.json file and modify any of the options to match your own preference. To reset back to the default values, simply delete the config file from your home directory. The following illustrates all the available options with their respective default values. If left undefined the home directory ~ will be used and taskbook will be set-up under ~/.taskbook/. Display tasks that are marked as complete. Display progress overview below the timeline and board views. The following is a minor walkthrough containing a set of examples on how to use taskbook. In case you spotted an error or think that an example is not to clear enough and should be further improved, please feel free to open an issue or pull request. To create a new task use the --task/-t option with your task's description following right after. To create a new note use the --note/-n option with your note's body following right after. Boards are automatically initialized when creating a new task or note. To create one or more boards, include their names, prefixed by the @ symbol, in the description of the about-to-be created item. As a result the newly created item will belong to all of the given boards. By default, items that do not contain any board names in their description are automatically added to the general purpose; My Board. To mark a task as complete/incomplete, use the --check/-c option followed by the ids of the target tasks. Note that the option will update to its opposite the complete status of the given tasks, thus checking a complete task will render it as pending and a pending task as complete. Duplicate ids are automatically filtered out. To mark a task as started/paused, use the --begin/-b option followed by the ids of the target tasks. The functionality of this option is the same as the one of the above described --check option. To mark one or more items as favorite, use the --star/-s option followed by the ids of the target items. The functionality of this option is the same as the one of the above described --check option. To copy to your system's clipboard the description of one or more items, use the --copy/-y option followed by the ids of the target items. Note that the option will also include the newline character as a separator to each pair of adjacent copied descriptions, thus resulting in a clear and readable stack of sentences on paste. Invoking taskbook without any options will display all of saved items grouped into their respective boards. To set a priority level for a task while initializing it, include the p:x syntax in the task's description, where x can be an integer of value 1, 2 or 3. Note that all tasks by default are created with a normal priority - 1. To update the priority level of a specific task after its creation, use the --priority/-p option along with the id the target task, prefixed by the @ symbol, and an integer of value 1, 2 or 3. Note that the order in which the target id and priority level are placed is not significant. To move an item to one or more boards, use the --move/-m option, followed by the target item id, prefixed by the @ symbol, and the name of the destination boards. The default My board can be accessed through the myboard keyword. The order in which the target id and board names are placed is not significant. To delete one or more items, use the --delete/-d options followed by the ids of the target items. Note that deleted items are automatically archived, and can be inspected or restored at any moment. Duplicate ids are automatically filtered out. To delete/clear all complete tasks at once across all boards, use the --clear option. Note that all deleted tasks are automatically archived, and can be inspected or restored at any moment. In order to discourage any possible accidental usage, the --clear option has no available shorter alias. To display all archived items, use the --archive/-a option. Note that all archived items are displayed in timeline view, based on their creation date. To restore one or more items, use the --restore/-r option followed by the ids of the target items. Note that the ids of all archived items can be seen when invoking the --archive/-a option. Duplicate ids are automatically filtered out. task, tasks, todo - Items that are tasks. note, notes - Items that are notes. pending, unchecked, incomplete - Items that are pending tasks. progress, started, begun - Items that are in-progress tasks. done, checked, complete - Items that complete tasks. star, starred - Items that are starred. To search for one of more items, use the --find/-f option, followed by your search terms.